I lived in the Canadian province of Saskatchewan for most of my teen years, and during those years, it was popular at Christmastime, to line the walkways in front of houses with lanterns made of ice, with a candle set inside. Our Montana winters our not nearly as cold as the ones I remember from my Saskatchewan days, but we usually spend at least a few weeks well below zero. The frosty, cold, clear nights of winter always remind me of the beautiful flicker of candlelight in the snow. 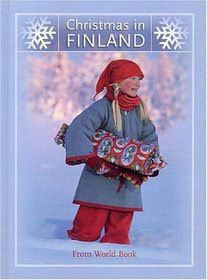 It just so happens we're experiencing a cold snap this week, and our Christmas countdown book yesterday, was World Book's Christmas in Finland (part of a really excellent Christmas Around the World series for children). The book is filled with maps, pictures (including a slightly risque shot, at least to my American eyes, of a family sauna), and descriptions of the Christmas festivities in that part of the world. There are ten recipes, and instructions for four craft projects, including an ice lantern very much like what I remember making in Canada, at the back of book. I knew as soon as I saw it, I'd have to make one, or maybe several, with the the children. We used to make our lanterns by freezing water in empty 1 gallon ice cream buckets (we lived on a college campus and there were lots of teenagers, so we had an abundance of empty ice cream buckets). Just the thought of that much ice cream makes me gain weight now. Luckily the World Book volume suggests using a mixing bowl for a mold, instead. ...and that we had a candle that would fit inside the cup. We put the bowl in the freezer, and waited a few hours, until the water in the bottom of bowl was frozen solid. Then, we placed our paper cup, weighted with marbles, on top of the layer of ice, filled the rest of the bowl with water, and placed it back into the freezer. It's important to make sure the water in the bottom of the bowl is frozen completely solid, and not just frozen over, or else your cup will fall through the ice, to the bottom of the bowl, when you add the additional water (we had that happen a couple of times, before we finally decided to be patient enough to do it right). If it's really cold outside, you can just set the bowl outside, instead of into the freezer. When the additional water was frozen, we removed ice from bowl, and the cup from the middle of the ice, using warm water, to help release the ice (be careful not to crack your bowl - ours is a temperature safe, Pyrex bowl). Then, we dropped our candle into the hole where the cup had been, and lit it. ...but even prettier outside, where the candle flame flickered, and reflected through the ice, out onto the snow. The ice does melt a little from the heat of the candle flame, but our tea light burned out, after about an hour (drowned in melted wax), without melting through the sides, or bottom of the ice holder. It will still be good to relight, and use for several more nights, or as long as the temperatures stay below freezing. Very good idea! We'll be making these this week! That is beautiful! We will have to try it soon! It is beautiful. With 55 degree rain, it will have to wait quite awhile for it to be cold enough for it to last here...we often don't get below zero weather at all. We usually get some time below freezing, however. Phyllis - I had to go back and see what I'd written. Writing about Sask. and Montana at the same time had me switching back and forth between F and C in my mind. This week we are actually below 0 Fahrenheit - but just barely - which means we could easily pop back up above freezing, at least in the sun, during the "heat" of the day. We don't always stay below 32 degrees during the winter, but often have a week that will touch -20s to -40s. So pretty! I bet they looked beautiful lining the walkways. We have had unseasonably warm weather (60s)here the last week or so. That is so beautiful! I can't imagine having weather that cold, but to my mind things like this are one of the few perks of cold weather. What a cool idea (ha, ha, pun intended!) We are having a serious cold snap here so we will have to try this. We finally did our cranberry science activities today! (Better late than never, right?) Thanks for all the fun ideas! These are so beautiful. Now I wish I were back in Spokane where it would be cold enough to do something like this. While it feels cold enough here due to the moisture in the air, it isn't quite that cold in the temps. We haven't done ours yet this year.... it's one of my very favorite winter projects! So magical. These are especially pretty if you add cranberries and evergreens! My kids and I do these every year, but this winter it hasn't been cold enough...hoping it chills out here in Michigan! Made a few of these in a plastic bucket when it was well below 0c here in our recent cold snap. I had to leave the buckets out for more than 24 hours, as my family got temporarily very busy! Unfortunately, every plastic bucket was broken by the ice! So, here is my suggestion- monitor any plastic buckets carefully, and get the lanterns out of their molds as soon as they're frozen! They look fantastic, though! In the end, it's beautiful and it was a huge hit with my boys.